Today was boss's day. Or is it boss' day? 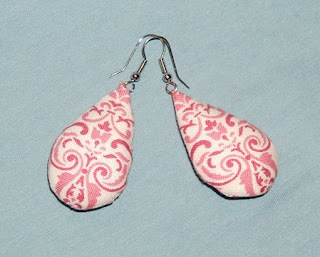 Anyway, I have a wonderful boss who also loves to sew and craft, so I made these earrings as a gift for her. They were pretty simple and fun to make. They are stuffed with filling (the photo doesn't quite capture the dimension). Inspired by a darling pair of earrings that my sister-in-law Kat's sister got for her in India. look at YOU!! That's awesome! They look sooo similar to the earrings I was wearing that day! SO cute. You are simply fabulous, ya know that? P.S. I love your hair. You rock it, girl!